BBC:-An overnight shooting in the US state of Mississippi has left eight people dead, including a local deputy sheriff, police say. The shootings took place in three separate locations in Lincoln County, south Mississippi. A male suspect, named in local media as Cory Godbolt, was detained on Sunday morning and is in police custody. Authorities say it is too early to consider any possible motive behind the killings. The deputy sheriff who died in the shooting was named as William Durr, 36. Mr Durr and three women were found dead at the scene of the shooting in Bogue Chitto, police said. The next shooting took place in Brookhaven, where “the bodies of two juvenile males were located”, police said. The third crime scene was in East Lincoln, where a man and woman were killed. The suspect, Cory Godbolt, spoke to local paper The Clarion-Ledger after he was detained. He said he was “sorry” and “ain’t fit to live, not after what I done”. He said he was in conversation with his wife and her family “about me taking my children home” when someone called the police. Cory Godbolt said he had been shot by someone, and was treated for a gunshot wound after being detained, the newspaper added. A 16-year-old, believed to have been taken hostage by the suspect, was safe, The Daily Leader reported. 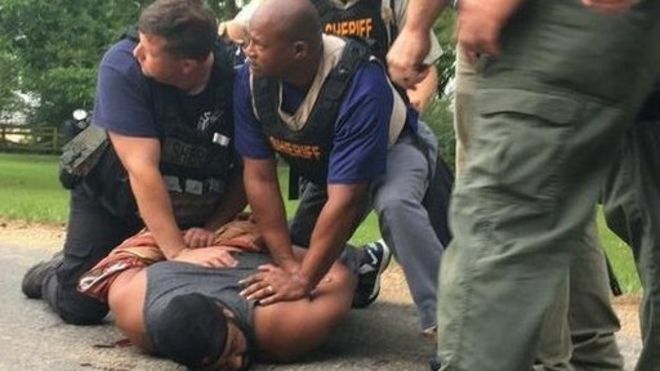 Mississippi governor Phil Bryant called the incident a “senseless tragedy”. “Every day, the men and women who wear the badge make some measure of sacrifice to protect and serve their communities. Too often, we lose one of our finest,” he said in a statement. Oh look, surprise surprise, another blackman on a shooting rampage. Can’t seem to see any “black lives matter” protesters. Why is that? Oh look, surprise surprise, another white man on a stabbing rampage in Portland. Oh look, surprise surprise, another Asian man on a bombing rampage in Manchester. what this guy did is reprehensible.However the atrocities that has been done by whites to other ethnicities is atrocious.So to anonymous #1 please get A life.What this low life did has nothing to do with the Black Lives Matter Movement.At the end of the day people whether black,white,Hispanic etc commit crimes based on their personal convictions,co-ercions,influence ,socio-economic conditions and the list is endless. You are quick to defend black lives matter but funny this person is right. The ppl he killed were black.What their life wasnt important being it was a domestic incident. Black lives matter should be in our commmunities whenever any of our lives are taken violently no matter by who. They only show up when police do the shooting.